Fun new recipe for your week! I’ve got a super easy recipe this week that really packs a punch! Tommy is my main sous chef in the kitchen and he has absolutely perfected this Whole30 Approved condiment. 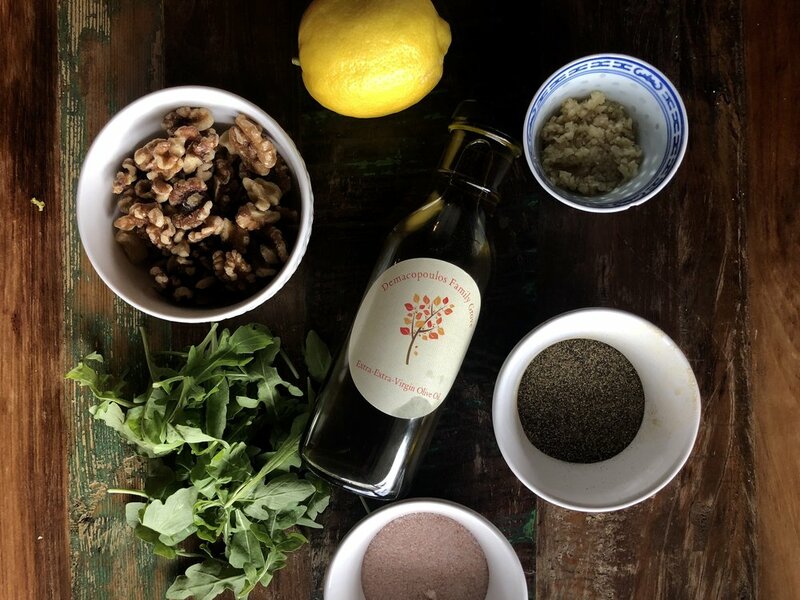 This Arugula Walnut Pesto is an interesting twist on the classic and is delicious on pretty much anything. I love mixing it in with zucchini noodles or spaghetti squash or even smothering it over some grilled chicken. If you are a snacker like I am, you can even use this pesto as a dip for your carrots or cucumbers! No matter how you put this pesto to use, it will serve as the perfect addition to any dish for extra flavor. Dump all ingredients into the food processor and blend until smooth. It's as simple as that! ENJOY!